Tomorrow is the first day if spring, and I thought I'd do some spring planting... 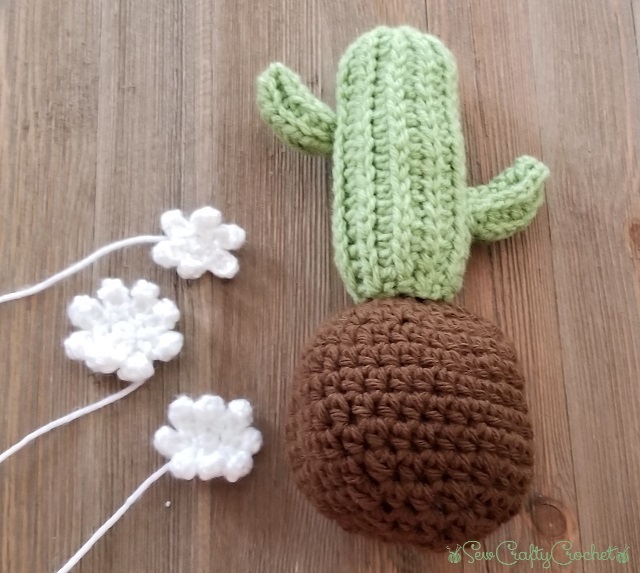 However, I do not have a green thumb, so instead, I decided to crochet some cacti. The cactus is everywhere, and I'm loving it. 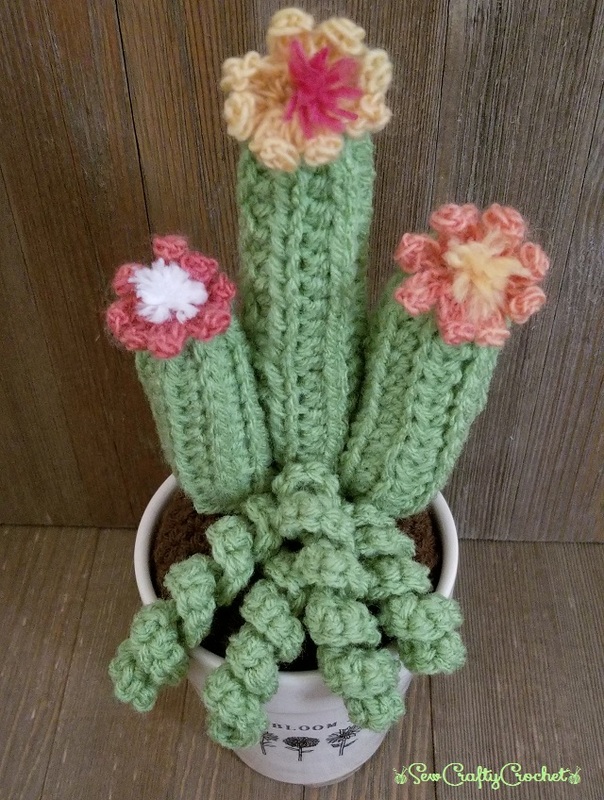 After seeing several crochet cactus creations, I decided to make some of my own. 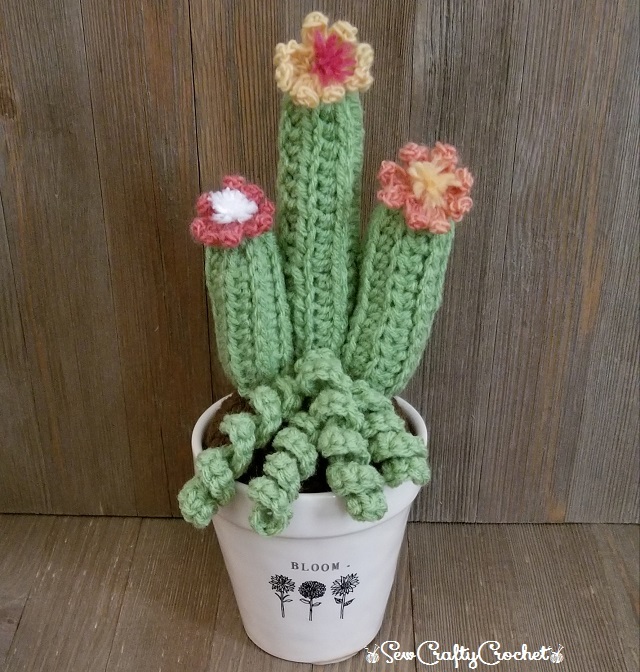 I am a collector of Rae Dunn pottery, and I decided that my Rae Dunn planters definitely needed some crochet cacti. 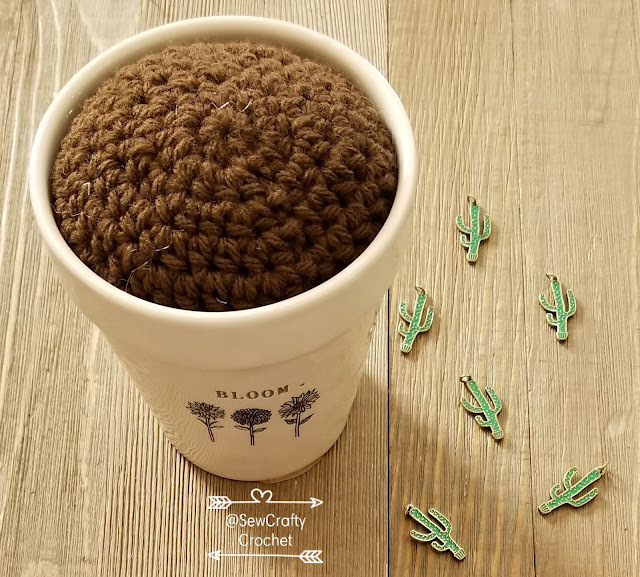 Each cactus needs soil, so I crocheted the soil first. 6 - 9) ch 1, hdc in each stitch, join. 14) hdc decrease around, join. Stuff with polyester fiber fill before closing. 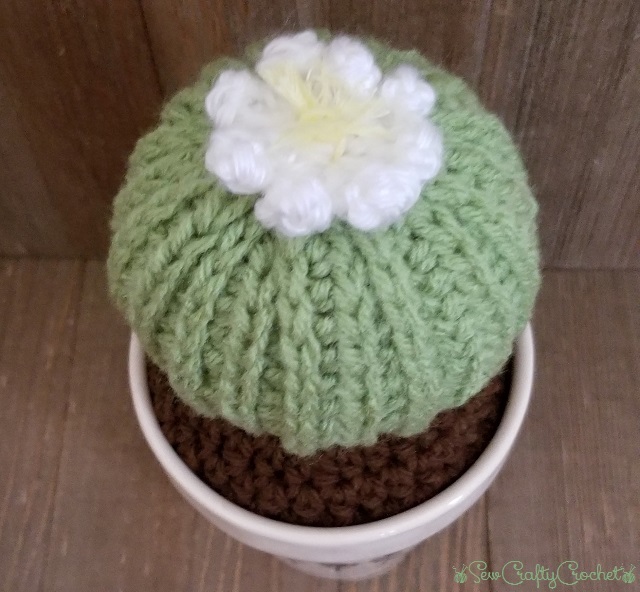 The first cactus I made was this round cactus. 1) hdc in 2nd ch from hook, hdc across, turn. 2) ch 1, hdc in back loop only across, turn. 3) ch 1, hdc in the front loop pictured above (no the normal front loop) across, turn. 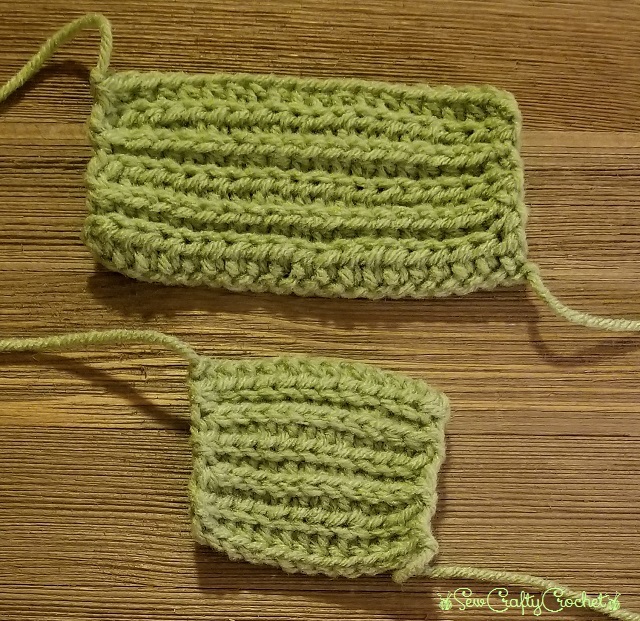 Whip stitch sides together with yarn needle. 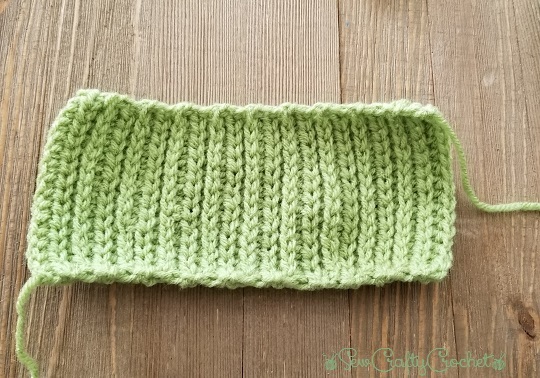 It kind of looks like knit. 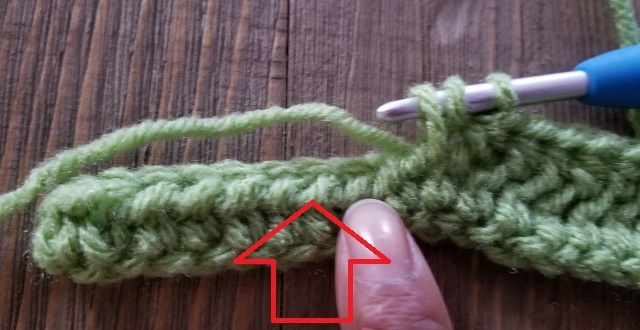 I closed one end by weaving yarn through stitches and pulling close like a drawstring. 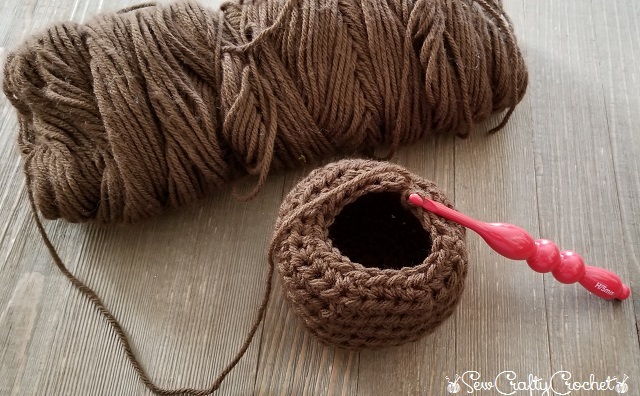 Stitch to the top of the soil with the yarn needle. Once the cactus was stitched to the soil, I added a flower. This flower was leftover from another cactus project, but I can't share the pattern for it since it is not mine. Sorry! 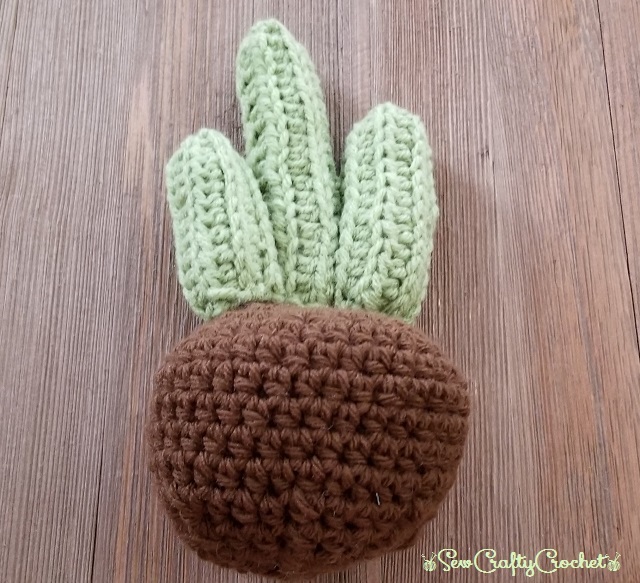 This is the next cactus I made. It's like a saguaro cactus. 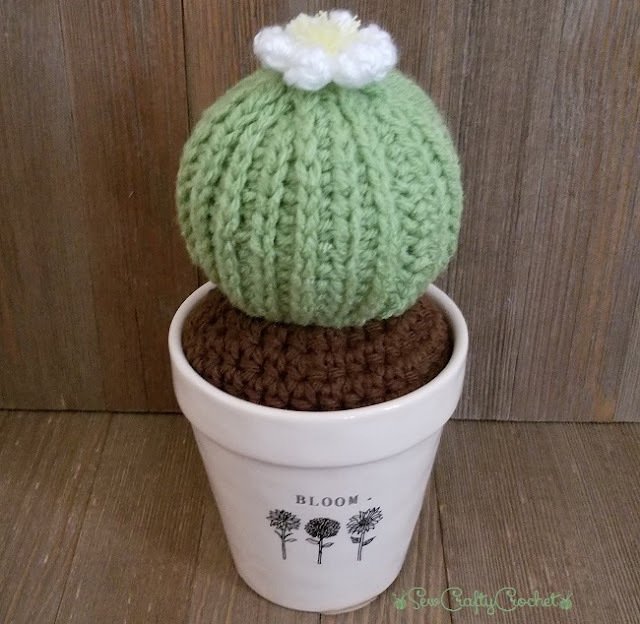 For this cactus, I crocheted rows just like with the round cactus. 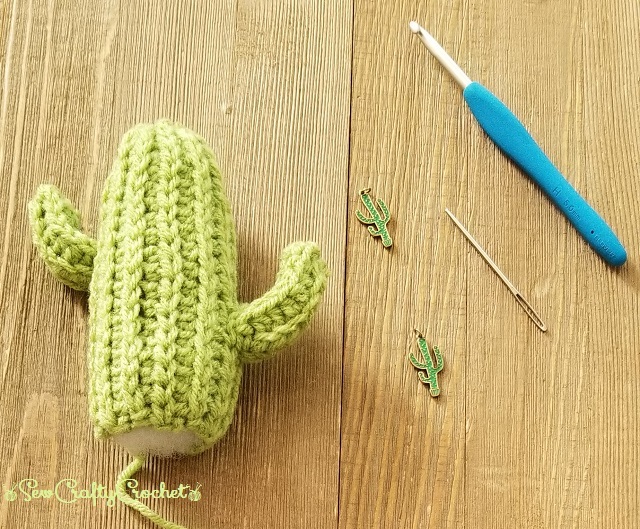 But for the body of this cactus, I began by chaining 20 crocheted with half double crochets in the alternating back loop only and front loop only rows until it measured 4.5 inches. 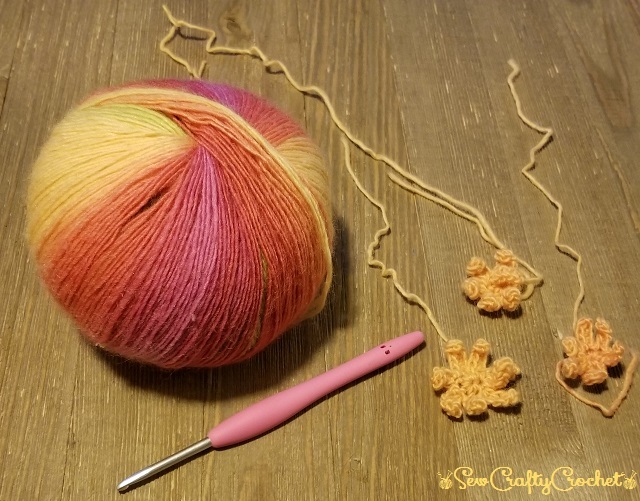 For the arms of the cactus, I chained 8 and crocheted with half double crochets until it measured 2 inches. Close one end and stuff. Stuff and stitch on the body. The cactus is sewn to the soil. The last cactus I made is this columnar cactus with spirally succulents. For this one, I crocheted the same as the others, but I began with different chain counts like 25 chains, 20 chains, and 15 chains. I stuffed the columnar cacti and sewed them onto the soil. 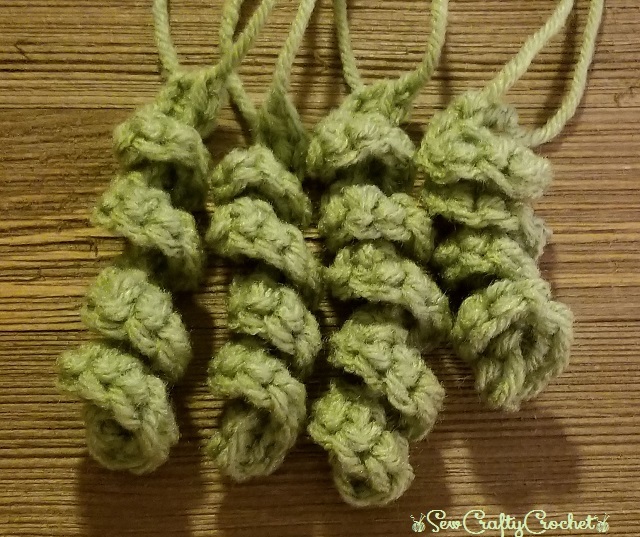 To make the succulent spirals, I chained 15 and crocheted 2 or 3 sc into each stitch. 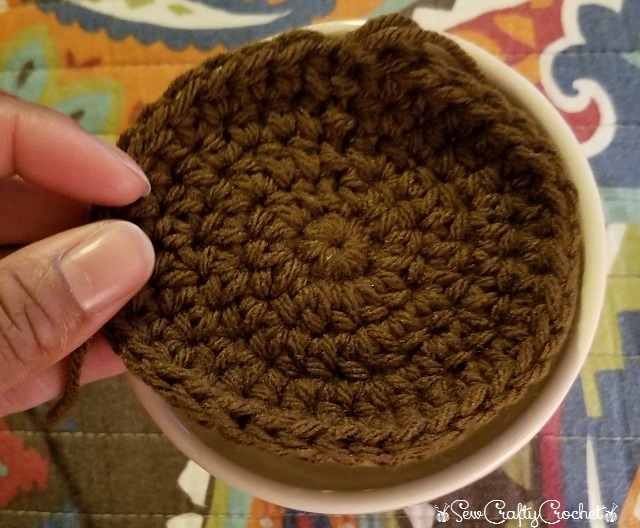 Once the spirals were made, I stitched them onto the soil. I added some colorful flowers. 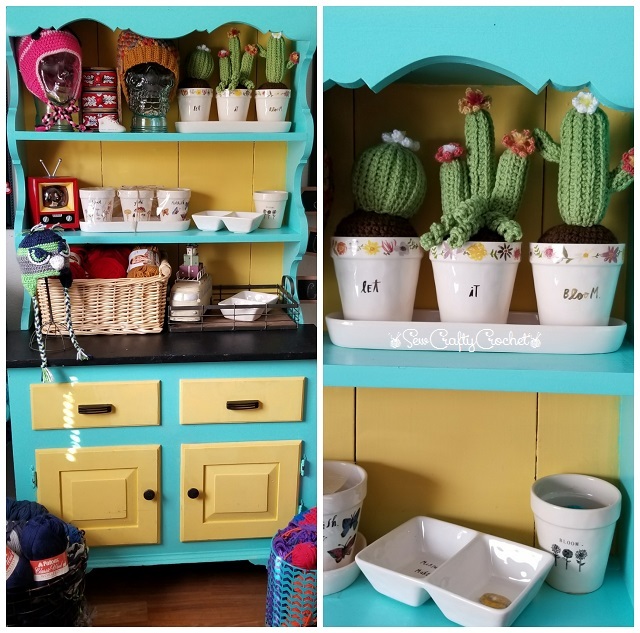 Once I finished the cacti, I put them in one of my favorite Rae Dunn planters and put them on my hutch. 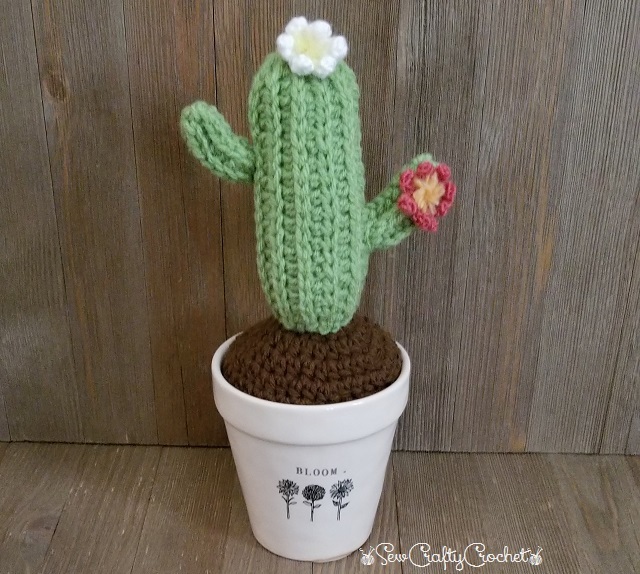 I have a couple more Rae Dunn planters, and I plan to crochet more cacti for them. These cacti are fun and quick to make. Thanks for stopping by and checking out my cacti! 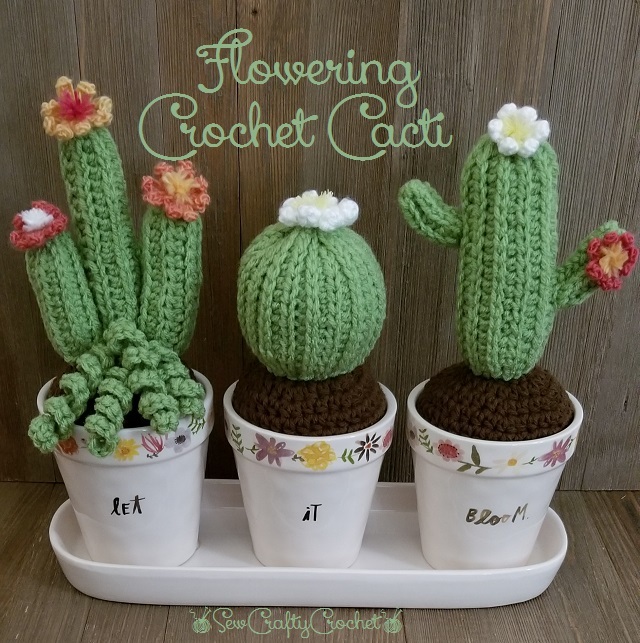 If this isn't the cutest crochet project I've ever seen! Wow! You amaze me each time with your awesome creations! Awwww thanks so much, Gail! You're too sweet! What great designs. Love the detail in your patterns. 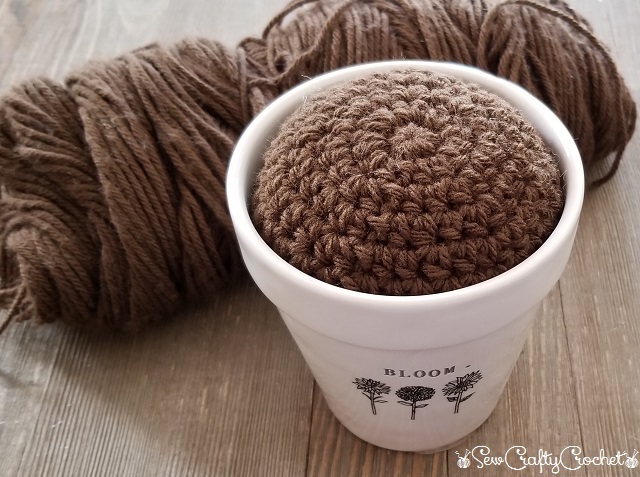 These are so adorable and cute to sit around whether you have a green thumb or not! I love them! Pinning to share. Love the new theme too! Thanks Laurie! And thanks for pinning! You are so talented! I'm always so impressed by your crochet projects. This is one of my favorites. 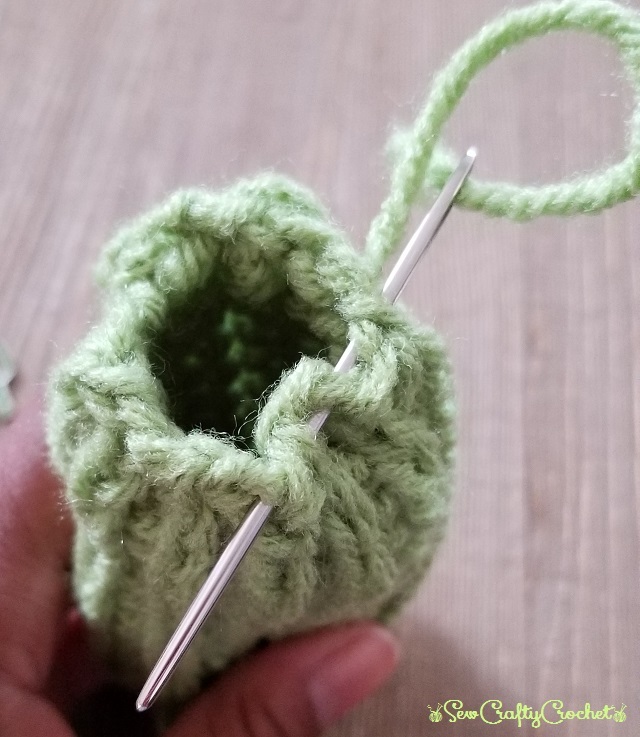 I'm sure those who crochet are excited that you provided the pattern. You are so imaginative! I would have never thought of crocheting cactus. It's adorable! Thanks, Carol! 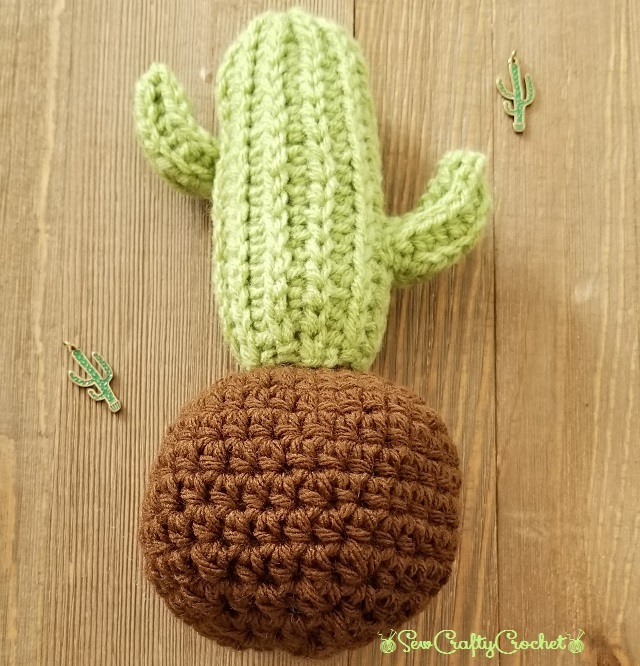 There's a cactus craze going on right now, and I've fallen in love with cacti! Again you knocked it out of the park on this one.😉 I love the little pots too. 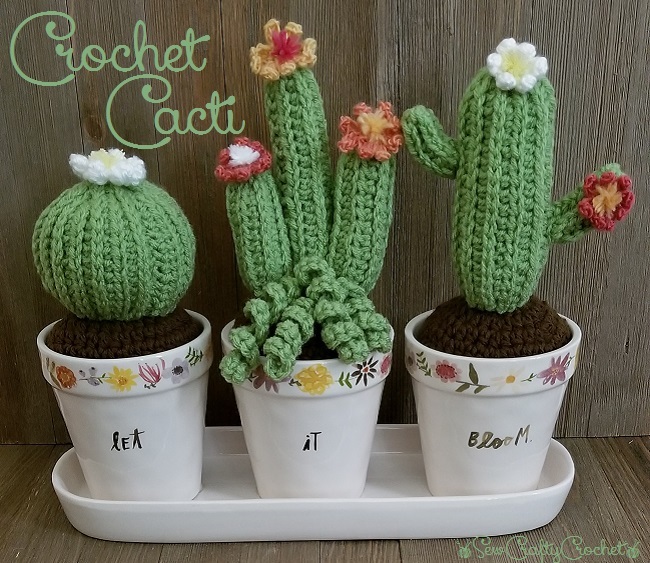 Cactus theme crafts are so hot right now. Thanks, Lorin! I've been bitten by the cactus bug! I'm kookoo for cocoa puffs over these. Love love love these guys. Nice handiwork. Those are so adorable! What a fun idea. Pinned. Thank you Marci! 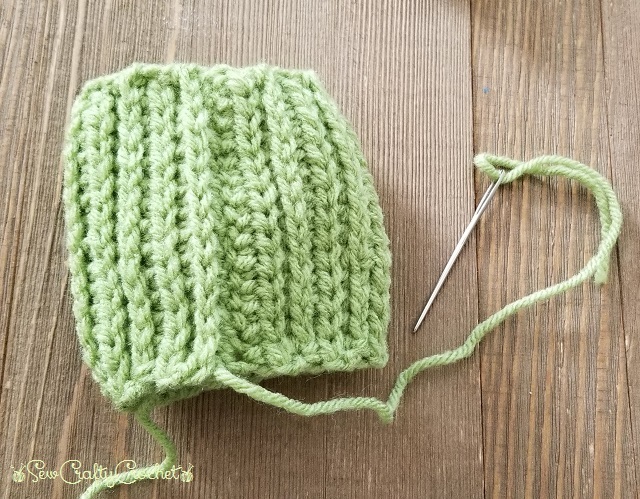 I can't wait to crochet more! Wow! 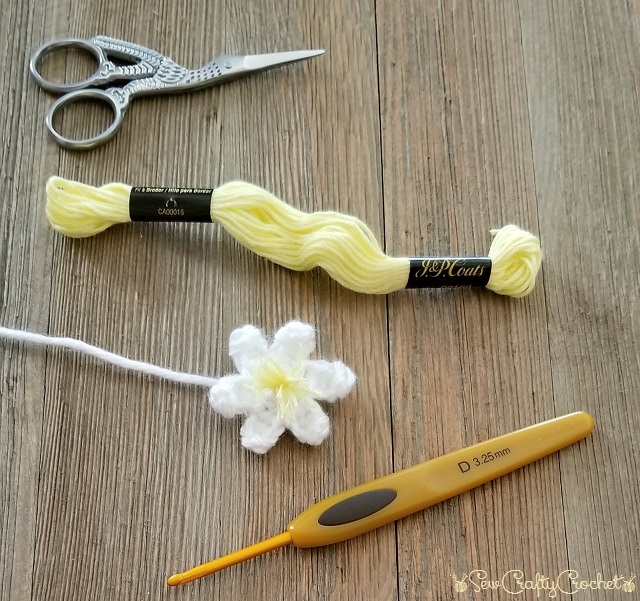 You are talented with a crochet hook! They look so pretty on your hutch. Thanks, Shirley! 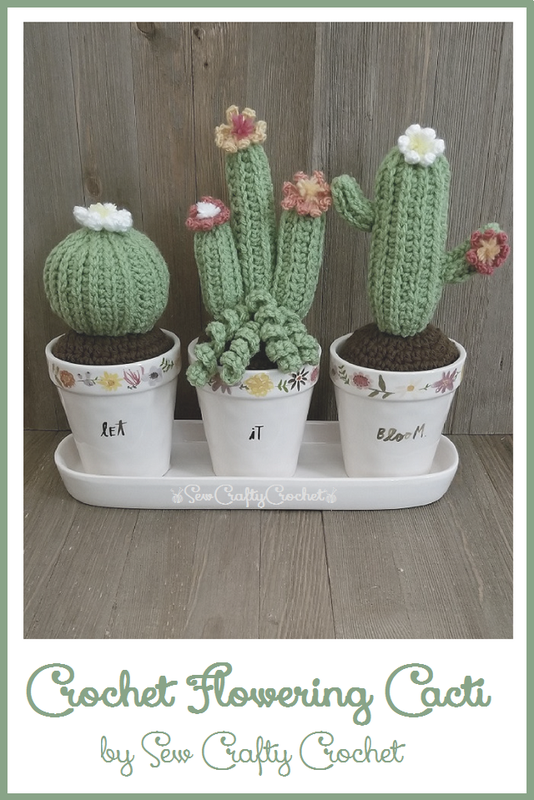 I plan to make more cacti to decorate my hutch! Omgee...how cute are these?! Perfect for those with brown thumbs...lol. You're totally inspiring me to take some crochet classes. Thanks! 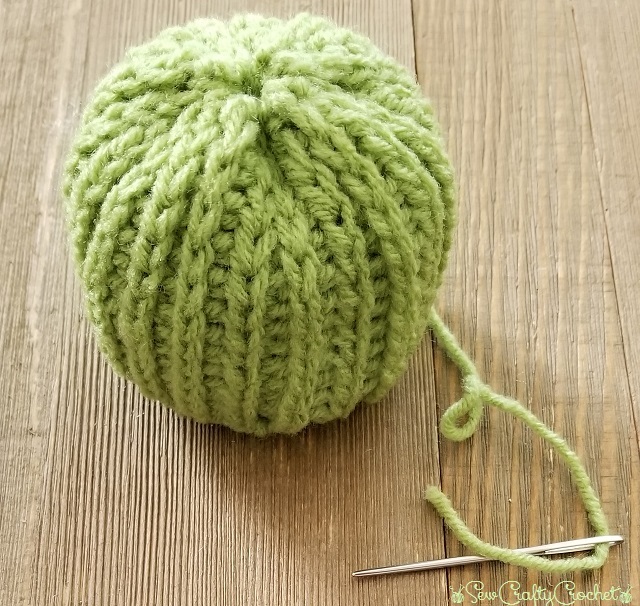 Crochet is such a great hobby! I highly recommend it! We visited our local botanical gardens over the weekend, and I so enjoyed the cacti display. Your project is just precious! Pinning! Thanks so much, Kristin! I haven't been to any gardens lately, but I enjoyed seeing real cacti (and tumbleweeds!) in the desert when we drove through Arizona couple months ago. Those are so cute. 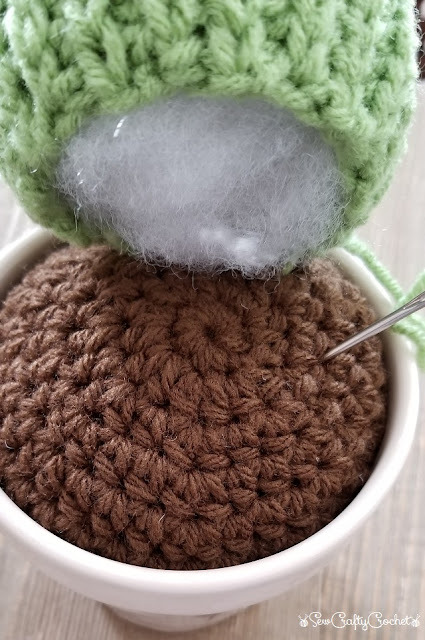 I wish I know how to crochet! I just love these cactus. I can't pass up anything that's crochet. These cactus are adorable. Oh my goodness so cute! As a new desert dweller, my brain is filled with all things cacti so featuring these when my party opens up tonight! I just love these ones too. They would be good flowers for me, as I am not very good with the real thing. 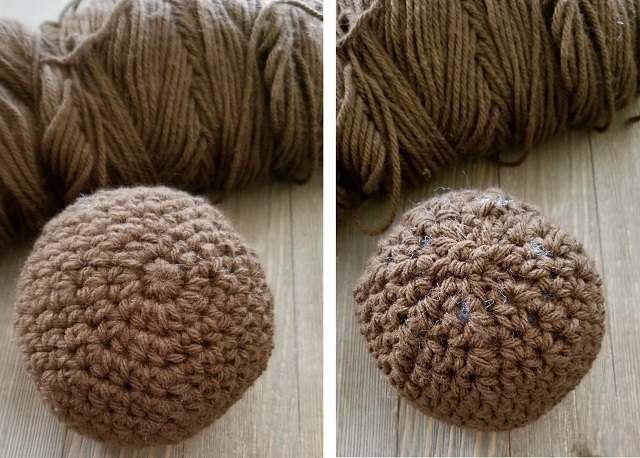 I don't know how to crochet but I had to pin this post anyway for the day I finally learn how. Thanks for sharing.